Should We Create A Northern Playground In Addition To A Northern Powerhouse? George Osborne and other politicians, thinkers, academics and businessmen talk about creating a Northern Powerhouse. I am very much in agreement to these aims, but from my London-based viewpoint, I tend to think that the North has a lot more to offer. Two of the bigger successes of the North in recent years have been the reinvigoration of Liverpool as one of the best tourist destinations in the world and the Tour de France in Yorkshire in 2014. So should any Northern Powerhouse plans, take more than a large nod to emphasising the leisure and tourism opportunities in the area? The government’s plan for transport in the North released yesterday and discussed in this post, is fifty years too late and if it’s implemented, it will be some years, before High Speed Trains touch 140 mph on the way between Liverpool and Hull and Newcastle. The high speed railway should remain an end objective, but in the mean time, we should do various things to make the wait bearable. The Electrification in the North study recommended that virtually all lines north of a line drawn between Chester and Lincoln be electrified. A rolling program should be planned that virtually eliminates diesel-powered passenger and freight trains. This would speed up services between all the major cities and also connect all of the wonderful rural lines that cross the Pennines and hug the coastline to major centres of population. So this electrification program is just as much Northern Playground as Northern Powerhouse. Plans for the North talk about an Oyster Card for the North. As so many Londoners will tell you, Oyster is old superseded technology and so last decade. We need a universal contactless ticketing system based on bank cards that works all over the UK! This would mean that you just turned up at any station, bus or tram stop in the UK, touched in and you’re off on your journey. Those who doubt this is possible, should spend a week using their bank card as a ticket in Greater London. They will find a system totally devoid or hassle and cash, well-liked by both passengers and staff. It also automatically gives you the cheapest price for the collection of journeys you take over a day, week or month. Leisure passengers by their more spasmodic and impulsive nature will benefit tremendously from simple contactless ticketing. As London was first in the world with decent maps and also because it is so large, that no resident knows the whole city, London needs comprehensive maps and travel information displayed everywhere in a common easily-understood and learned format. As the combined population of the North of England is upwards of eleven million as against the eight of Greater London in a wider area, I suspect those in the North find themselves in an unknown area more often than those in Greater London. So one thing that the North needs for both Playground and Powerhouse is a universal mapping and information system, which is the same all across the various parts of the North. I feel that the North should use London’s system, which includes. 1, A detailed local walking map on every bus stop, tram stop and station. 2. Comprehensive bus information at every station. 3, A detailed bus spider map on every bus stop, tram stop and station. 4. A five digit number on every bus stop, which if sent as an SMS message to a short SMS number, gives details of the next few buses. ,I doubt that this will ever happen, as no council in the North would ever allow something to be used in exactly the same way as it is in London. Or if it was one of the larger cities, in the same format as another. If the system relied on passengers having and using smart phones, then it should be prohibited. But quite frankly, at the moment the information systems in the North are truly dreadful. This is a list of the major cities of the North and typical fastest journey times by train to and from London. This list shows several things. 1. Many of the direct journeys between London and the North could be brought consistently under two hours, once ERTMS allows 140 mph running on the East Coast Main Line and the West Coast Main Line in a few years time. 2. Electrification of the Midland Main Line to Sheffield will bring that city consistently under two hours from London, which will speed up the journey to Barnsley, Rotherham and other places. 3. Some destinations like Blackpool, Bradford, Huddersfield, Hull and Middlesbrough would get a significantly faster service to and from London, if there was no need to change. If we get the expected speed up on the East and West Coast Main Lines, what sort of times will we get to the major cities in the North. Adjusting for the probable speed increase from 125 to 140 mph. gives these estimates for the following journeys. I think we can say that in a few years time, many more towns and cities in the North will be within two hours from London, which can only be beneficial to those places for both Powerhouse and Playground purposes. I regularly go to the North for the day by train to see football. Some places like Middlesbrough and Blackburn are tiring journeys, but get them under two hours and leisure traffic can’t help but increase, especially, if there were more affordable good hotels and better late train services back to London..
More places could be brought under the important two hour ideal, if perhaps the east-west routes interfaced better with the north-south ones at places like Darlington, Doncaster, Leeds, Preston and York. In an ideal world, a passenger from say London to Hull, should be able to step off a northbound train at Doncaster and just by walking across the platform to step on to a train for Hull. At the same time passengers from Sheffield and Rotherham going to Newcastle would just step across the platform the other way. This may seem rather utopian, but precise timing of trains is what ERTMS is supposed to enable. The easier it is to get between any two points in the North, the more things will be improved. When the upgrade and electrification of the Midland Main Line is completed in 2020, there will be three major 140 mph railways between London and the North. To complement these there needs to be High Speed Lines across the country from say Liverpool to Hull and Newcastle. Any east-west lines will connect with the north-south lines at places like Darlington, Doncaster, Leeds, Manchester, Newcastle, Preston, Sheffield and York. As I said in the previous section, there needs to be good interfaces between the two sets of lines to speed up journeys to stations that are a change away from the north-south lines. At some point in the future, there will be a need for purpose-built High Speed Lines across the county. But by the time this is done, I think tunnelling techniques will have improved to such a degree that instead of building a surface railway with all the planning and other difficulties that entails, a tunnel will be bored under the Pennines to connect Hull and Doncaster with Liverpool. The tunnel would be arranged to pass under major stations like Sheffield and Manchester Piccadilly and could connect to them by lifts and escalators. Such a tunnel could be bored to a W10 loading gauge, so that it could transfer freight containers under the Pennines to link Liverpool and the West Coast Main Line with the Electric Spine to Southampton and the East Coast Main Line to London Gateway and Felixstowe. I believe a high-capacity freight railway between east and west through the Pennines, will have the same effect as theFelixstowe-Nuneaton freight corridor has had on the A14. This Google Earth image shows the towns and cities between Liverpool and Hull. It may seem a long way to bore a tunnel even if it didn’t go all the distance, but we’re probably talking about 2030 and the machines then, will make today’s machines look like toys. The tunnel would probably start west of Manchester and go to east of Sheffield, which would be under fifty kilometres, connecting to Liverpool and Hull by means of surface lines. Also if any new route could handle freight and link the Port of Liverpool to the east side of England this could have interesting possibilities. For instance, would it be quicker for containerised freight from the United States and Canada to reach Germany and Central Europe if it went via Liverpool and a freight train through the Channel Tunnel? Plans of this nature have existed for years, but none has ever been implemented. Some proposals for the Great Central Railway are given here. It all goes to show that modern technology will create lots of options for putting a High Speed Line across the country. Both Powerhouse and Playground will benefit. This was a thoroughly entertaining match, which I saw on my first visit to Vicarage Road since the opening of the new Sir Elton John stand. Watford were on a roll of winning six out of their previous seven home matches and were sitting on top of the Championship after scoring lots of goals, so I didn’t go to the match with any thoughts of not being beaten. And probably beaten substantially! But the Ipswich Team were reading a different script and during the ninety minutes their defence held firm and didn’t allow Watford to get a single shot on target. The midfield of Scuse, Varney, the diminutive Tab and Bru were key in that they seemed to snuffing out many Watford attacks before they started. Hopefully for the remaining matches some of Ipswich’s injured midfield will be able to return. At least Stephen Hunt was on the bench! Kevin Bru is one of Mick McCarthy’s finds of the season, who was born in Paris and came to Suffolk by a roundabout route which included a lot of lesser French clubs and Levski Sofia in Bulgaria. He was on superb form and was the leader of the midfield pack. He could have scored with an audacious volley with the outside of his right foot from just outside the penalty area, but it just went the wrong side of the post. I suspect he learned that sort of skill playing street football in a Paris banlieue. It’s not something you see from an English player. 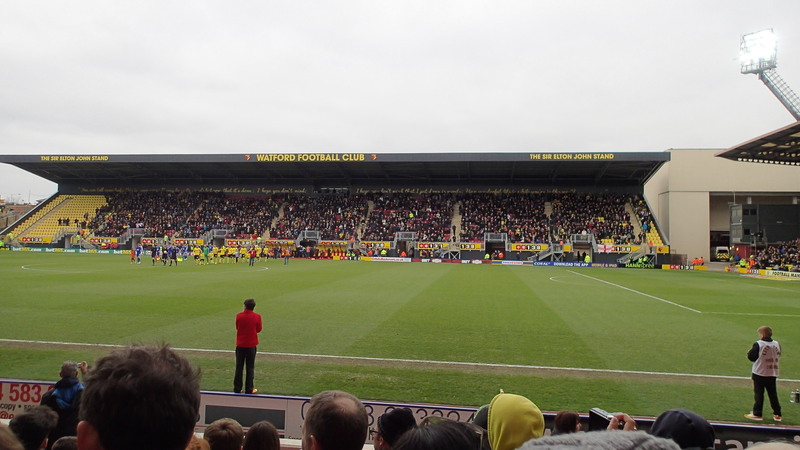 The match was drifting towards a goal-less draw and as Watford pressed harder to win the match, in the ninety-fourth minute, Tabb hooked the ball speculatively away, Freddie Sears dispossessed their centre back, who should have cleared it, and then put Richard Chaplow through to score the winning goal, which no-one thought would come for Ipswich. Throughout the match, the Ipswich crowd were their usual superb best and they will be key in the remaining seven matches of the normal season. I intend to be at every one! If you look at the last seven years of the Championship, it would appear that to get promoted directly without going through the play-offs, a team needs to at least get more than eighty points. To do this Town need at least fourteen points from those seven matches. The away matches at Wolves, Huddersfield and Blackburn, are best described as tricky rather than difficult, so if we can get five points on the road from these matches, whether we get to eighty will be down to the home form, where the supreme test is Bournemouth on Good Friday. I will be surprised if the match is not a total sell-out! A friend pointed out that after yesterday, Town has won every match they’ve played inside the M25. And where is Wembley, should the team get to the play-off final? I want to fit a grab rail in my bathroom and these pictures show the position and the rail. I want to put it at an angle so that I can pull myself upright safely to get out of the bath. The first problem is positioning it in the right place. The easiest way is to lie in the empty bath whilst someone else holds it tightly to the wall. The second problem is that the tiles are very hard to drill, so I intend to use a strong epoxy to glue the grab rail to the wall. Mixing the epoxy and getting it in the right position is definitely a job for at least three hands. Perhaps we need a Rent-A-Hand Agency, where someone can help you out on a barter or mutual basis. Where is my late wife, when you desperately need her? When I went to Liverpool University in October 1965. According to Wikipedia, electric trains between London and Liverpool and Manchester, started public service in April 1966. I can remember once taking a late train to London from Liverpool and a time of five hours forty minutes stricks in my mind. The electric service between the North West and London is faster and more frequent now, but in some ways services between London and Blackpool and other places, is worse than it was in the 1960s, when there were direct trains. In addition Leeds and Newcastle were connected to London by an electrified East Coast Main Line in 1990. Over the last fifty years, since I first emerged into Lime Street, Liverpool and Leeds have developed local electric railways and Manchester has created a tram network. On the negative side, the electrified railway between Manchester and Sheffield has been ripped out. The contempt for the North shown by successive Governments under Wilson, Callaghan, Heath, Thatcher, Major, Blair and Brown, by not even creating a plan to build a modern electrified railway from Liverpool to Newcastle and Hull, is one of the greatest political disgraces in this country, ranking with the day that Chamberlain thought he’d got a deal with Hitler. But now, that plan is emerging to create that railway that the French or the Italians would have built before the 1970s. It’s here on the BBC and this is the first two paragraphs. The Northern Transport Strategy report details what George Osborne believes will create a “northern powerhouse”. This plan or at least a simpler one which only used 100 mph trains, should have been created in the 1960s. All those politicians who failed the north should hang their heads in shame. I blame Harold Wilson in particular, as surely being a Yorkshireman representing a Lancashire constiuency, he should have known the value of good rail links across the country. I suppose that until recently, trains didn’t get any votes outside London and the South East, but wide and empty new motorways do. In some ways, I find that all the rail developments in the North are being driven, by that most unlikely champion; the St. Pauls and Oxford-educated Tory Chancellor; George Osborne, who said this about the plans according to the BBC report. Connecting up the great cities of the North is at the heart of our plan to build a northern powerhouse. From backing high-speed rail to introducing simpler fares right across the North, our ambitious plans for transport mean we will deliver a truly national recovery where every part of the country will share in Britain’s prosperity. But then Osborne is someone, who spent a lot of their formative years in London. I suspect as a teenager he roamed all over the city on the Underground and the buses, as I did. It is the sort of experience, that gives you the opinion that good public transport is a necessity for prosperity for all those who live and work in an area. Sorting out the public transport in the North with electrified fast trains and contactless ticketing at its heart, should be something that anybody standing in the May election should be made to sign up to, before they are allowed to be a candidate.